Panos Cosmatos' trippy sci-fi oddity, Beyond the Black Rainbow, is a film that consistently defies categorization. On the one hand, it is a clear homage to the science fiction films of the 1970s and early 80s, recalling such works as Stanley Kubrick's A Clockwork Orange and Rainer Werner Fassbinder's World on a Wire. 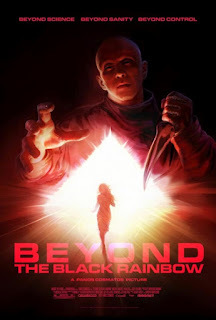 On the other hand, Beyond the Black Rainbow is a wholly original work, a brilliantly conceived mindbender that deftly recreates the look and feel of 70s sci-fi and turns it into vibrant and remarkable work of art. One could argue that what we have here is style over substance - Drive for the sci-fi set. But like Nicholas Winding Refn's acclaimed genre exercise, the style is the substance, and there is so much to explore beneath its gorgeous colors. Those looking for a strong sci-fi plot, however, are advised to look elsewhere, because Beyond the Black Rainbow is sort of like the last 20 minutes of 2001: A Space Odyssey stretched out over an entire movie. Eva Allan in BEYOND THE BLACK RAINBOW, a Magnet Release. Set in 1983, the film is like a vision of the future straight out of the past. In a cheesy informational video, a talking head introduces us to Arboria, a company with a new technology devoted to creating happiness. It will lead to peace and harmony, we are told. This technology is here for our benefit, to improve our quality of life. But deep voiced, white haired businessmen are never to be trusted in films such as this, and indeed the center of this wonderful new happiness drug is a more of an asylum than anything else, where a young girl is under the ever watchful eye of an increasingly obsessed doctor. Who is this doctor? What does he want with this girl? What was his relationship with her mother? And why do these people have her locked up? These questions linger in the mind while watching Beyond the Black Rainbow, but they are ultimately questions that don't really matter. Cosmatos states in the film's press notes that his goal was to recreate the lurid science fiction thrillers of the late 70s and 80s felt to him as a boy, as he perused their eye-catching box art at the local video store. This film is the result of a lifetime of absorbing these films and creating an almost impressionistic portrait of his own youth through the lens of the pop culture of the era. And in that regard, this is really something special indeed. Michael Rogers in BEYOND THE BLACK RAINBOW, a Magnet Release. Beyond the Black Rainbow is, for all intents and purposes, refracted fragments of memory, congealed over three decades of movie watching into one glorious, impressionistic package. From the vibrant lighting to the thumping synthesizer score by Jeremy Schmidt (which would feel right at home in a John Carpenter film), the film seems to exude a very specific era and genre, and it does so with exquisite detail. It doesn't concern itself too deeply with a conventional plot, it triggers memories and flashbacks, feelings and moods lost in hazy recollections of dreams long since faded. And despite its clear emulation of films that have come before, there's really nothing else like it. Cosmatos has managed to pay homage to a 70s sci-fi without slipping into parody or cheap imitation. It actually feels like a product of the era it seeks to evoke. In fact it's quite possible that if someone didn't know this was a new film going into it, they might mistake it for something that's 35 years old. That's the great beauty of it. This isn't some kind of Tarantino/Rodriguez exercise in ironic genre wankery - it's something far deeper and more personal than that. Beyond the Black Rainbow is fanboy homage meets surrealist fantasia, an incredible journey into a bygone era's bleak vision of the future, emerging from the dustbin of cinema history with something wholly, thrillingly, wonderfully new. BEYOND THE BLACK RAINBOW | Directed by Panos Cosmatos | Stars Eva Allen, Michael Rogers | Rated R for some bloody violence, disturbing images, a graphic sexual illustration, language and drug content | Now playing in NYC. Opens in LA 6/21.